Occurrence: Generally as cooked frogs legs. Allergy Information: There are few reports of allergy to frog, although at least three cases with severe symptoms have been reported. This allergy seems to occur after individuals develop allergy to fish in most cases although two cases have been reported which seem to show direct sensitisation by frog. Other Information: This entry also contains information on other edible frogs including the bullfrog, Rana catesbeiana (NEWT 8400, ITIS 173441). Hilger et al. (2002)  report the case of a 47-year-old man who initially suffered itching and discomfort in his throat a couple of minutes after eating several fried frog legs. Subsequently, he developed respiratory symptoms, culminating in a severe anaphylactic episode requiring emergency treatment. The authors suggest that the severity of the symptoms might have been partially due to the patient taking a beta-blocker drug as well as an inhibitor of the angiotensin-converting enzyme. Romano et al. (2000)  report the case of a 6 year old girl with a severe anaphylactic reaction after the ingestion of boiled frogs (R. esculenta). She had previously been diagnosed with allergy to several other foods including fish and SPT confirmed these sensitivities. Steurich (1996)  report several cases of occupational allergy to frogs including a cook who initial had occupational allergy but also suffered anaphylaxis on tasting frog. Food/Type of allergen:Hilger et al. (2004)  used recombinant alpha- and beta-parvalbumins (at 0.1, 1, 10 µg/ml and 0.07, 0.7, 7 µg/ml respectively) diluted in 0.03% human albumin, 0.9% NaCl, 0.4% Phenol (ALK ABELLO, Horsholm, DK). Protocol: (controls, definition of positive etc)Hilger et al. (2004)  performed skin prick tests on the forearms of the patients. Histamine was used as a positive control and the diluent as negative control. Skin reactions were recorded 20 min after testing. Positive results were graded as follows: (+) when the diameter of the wheal was 3.5 mm, (++) for 5-10 mm, and (+++) for 10-15 mm. Number of Patients:Hilger et al. (2004)  tested 3 fish allergic patients. Summary of Results:Hilger et al. (2004)  reported that 1 patient was positive for alpha-parvalbumin at a concentration of 10 µg/ml (++) and for beta-parvalbumin at 0.7 µg/ml (++). A second was doubtfully positive for alpha-parvalbumin at a concentration of 10 µg/ml (++) and clearly positive for beta-parvalbumin at a concentration of 0.07 µg/ml (+), 0.7 g/ml (++) and 7 g/ml (+++). The third was negative for alpha-parvalbumin and positive for beta-parvalbumin at a concentration of 0.07 µg/ml (++) and 0.7 g/ml (+++). Hamada et al. (2004)  used purified frog (Rana catesbeiana) or fish parvalbumins. Hilger et al. (2002)  and Hilger et al. (2004)  made extracts of frog skeletal muscle (and fish muscle) which were disrupted in single detergent lysis buffer (50 mM Tris-HCl pH 8, 150 mM NaCl, 1% (v/v) Triton X-100, 100 µg/ml Phenylmethylsulfonyl fluoride (PMSF) (Sigma, St Louis, MO) by a rotor-stator homogenizer (Kinematica, Luzern, Switzerland). The extract was centrifuged for 10 min at 5300 x g to remove insoluble particles and the protein concentration of the supernatant was determined by Bio-Rad protein assay (Bio-Rad, Nazareth, Belgium). Romano et al. (2000)  made an extract (5% w/v in PBS) from the frog meat (all body). Hamada et al. (2004)  used ELISA, ELISA inhibition and immunoblotting. Hilger et al. (2004)  used ELISA inhibition, immunoblotting and immunoblot inhibition. Hilger et al. (2002)  used immunoblotting. Romano et al. (2000)  used RAST. Hamada et al. (2004)  tested sera from 14 fish allergic patients. Hilger et al. (2004)  tested sera from 16 fish allergic patients and the patient of Romano et al. (2000) . Hilger et al. (2002)  tested sera from a single frog allergic patient. Romano et al. (2000)  tested sera from a single frog allergic patient. Hamada et al. (2004)  reported that of the 12 sera with IgE binding to mackerel and tuna beta-parvalbumins, IgE from 1/12 sera bound most strongly to frog alpha-parvalbumin, IgE from 6 sera bound most strongly to frog beta-parvalbumin, IgE from 1/12 sera bound approximately equally to both parvalbumins and IgE from 4/12 sera did not bind. Hilger et al. (2004)  reported that recombinant frog beta-parvalbumin was recognized by the three patient sera analyzed and IgE binding was abolished by inhibition with purified cod parvalbumin. Only 1 of 3 sera was weakly positive for recombinant frog alpha-parvalbumin and was also completely inhibited by purified cod parvalbumin. Romano et al. (2000)  report that their patient was RAST positive (class 3) to frog. Immunoblotting separation:Hilger et al. (2002)  and Hilger et al. (2004)  separated proteins by 18% SDS-PAGE gels under denaturing conditions. Immunoblotting detection method:Hilger et al. (2002)  and Hilger et al. (2004)  transferred proteins onto polyvinylidene difluoride (PVDF) membranes (Millipore). Membranes were incubated in blocking buffer of TBS/0.05% (v/v) Tween-20, 2% (w/v) cold water fish gelatine (Sigma). The PVDF membrane was cut into strips which were incubated overnight with patients' sera diluted one-tenth in blocking buffer. Strips were washed four times with TBS/0.05% (v/v) Tween-20. Bound IgE were detected with anti-human IgE antibody labeled with alkaline phosphatase (Sigma) and the blots were developed by addition of nitro blue tetrazolium/5-bromo-4-chloro-3-indolyl-phosphate (NBT/BCIP) (Promega, Madison, WI, USA). Hilger et al. (2002)  reported IgE binding to a protein at approximately 10 kDa which was identified as the alpha-parvalbumin from the unknown Indonesian frog species. Hilger et al. (2004)  showed that 3 of 13 patients had IgE antibodies reacting with recombinant frog alpha-parvalbumin and 11 of 12 patients reacted with beta-parvalbumin. They also found that binding of IgE from the patient of Romano et al. (2000)  was inhibited with purified cod parvalbumin or recombinant frog beta-parvalbumin. Removal of calcium by 5 mM EGTA, pH 7.5, caused the binding in immunoblots with the 7 tested sera to be reduced or abolished. Hamada et al. (2004)  and Hilger et al. (2004)  show that frog parvalbumins cross-react with those from fin fish. The patient of Romano et al. (2000)  was also fish allergic. However, the cases reported by Hilger et al. (2002)  and Steurich (1996)  show that frog allergy can also occur independently. Occupational asthma and allergy to frogs has been reported (Charpin, 1953 ; Nakazawa et al. 1983 ; Armentia et al. 1988 ; Holtz et al. 1993 ). Outside of the small group of edible frogs, many frogs contain toxins or venoms. Contact with these frogs can produce symptoms requiring careful analysis including the possibility of an allergic reaction (Forbes et al. 1995 ). Hilger C, Thill L, Grigioni F, Lehners C, Falagiani P, Ferrara A, Romano C, Stevens W, Hentges F.
IgE antibodies of fish allergic patients cross-react with frog parvalbumin. Hilger C, Grigioni F, Thill L, Mertens L, Hentges F.
Severe IgE-mediated anaphylaxis following consumption of fried frog legs: definition of alpha-parvalbumin as the allergen in cause. A case of allergy to frogs legs. Romano C, Ferrara AM, Cislaghi C, Falagiani P.
Forbes MJ, Tyler MJ, de la Lande IS. Allergic response to Brunei frog Staurois natator. Holtz J, Frechelin E, Noel B, Savolainen H.
A case of frog allergy: antigenic skin protein. 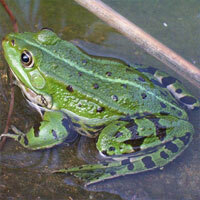 Armentia A, Martin-Santos J, Subiza J, Pola J, Zapata C, Valdivieso R, Losada E.
Occupational asthma due to frogs. Nakazawa T, Inazawa M, Fueki R, Kobayashi S.
A new occupational allergy due to frogs. Une cause rare d'asthme allergie professionel. Protein Family:EF hand calcium binding proteins, Pfam PF00036; efhand. Allergen epitopes:Bugajska-Schretter et al. (1998)  show that IgE binding to carp beta-parvalbumin is very much stronger in the presense of calcium, when the protein is in its native folded form, suggesting that the epitopes are primarily conformational. Similarly, Hilger et al. (2004)  showed that IgE binding to frog extract was greatly reduced by removal of calcium. Process, chemical, enzymatic:Most parvalbumins quickly refold in the presence of calcium and thus allergenicity survives cooking. Hamada et al. (2004)  showed that IgE from sera of fish allergic patients frequently bound to bullfrog parvalbumins. Of the 12 sera with IgE binding to mackerel and tuna beta-parvalbumins, IgE from 1/12 sera bound most strongly to alpha-parvalbumin, IgE from 6 sera bound most strongly to beta-parvalbumin, IgE from 1/12 sera bound approximately equally to both parvalbumins and IgE from 4/12 sera did not bind to either frog parvalbumin. Hilger et al. (2004)  tested the binding of IgE from sera of 16 cod allergic patients to cod and edible frog extracts and recombinant edible frog parvalbumins. IgE from 15/16 sera bound cod parvalbumin and 14/16 bound to low molecular mass proteins in a frog extract. 3 of 13 patients had IgE antibodies reacting with recombinant frog alpha-parvalbumin and 11 of 12 patients reacted with beta-parvalbumin. Allergen properties & biological function:Parvalbumins control the flow of calcium from troponin C back to membrane bound pumps after a muscle contraction. Each parvalbumin can bind two calcium or (with lower affinity) magnesium ions. Hilger et al. (2002)  purified small quantities of alpha- and beta-parvalbumins from Rana esculenta and Rana spp. by SDS-PAGE (18% acrylamide) in a MiniPrep Cell (Bio-Rad) for microsequencing. Recombinant alpha- and beta-parvalbumins were expressed in Escherichia coli with an N-terminal 6-histidine tail. The recombinant proteins were purified by Nickel-nitrilotriacetic acid (Ni-NTA) resin (Qiagen, Hilden, Germany) under denaturing conditions. Hamada et al. (2004)  purified parvalbumins from bullfrog skeletal muscle, homogenized with 3 volumes of 0.15 M NaCl in 0.01 M phosphate buffer, pH 7.0, and centrifuged at 18000 x g for 20 min. at 4° C. The supernatant was concentrated in vacuo and chromatographed on a Sepadex G-75 size exclusion column equilbrated with 0.15 M NaCl in 0.01 M phosphate buffer, pH 7.0. Fractions containing parvalbumin were identified by ELISA, pooled and applied to reverse phase HPLC on a TSKgel ODS-120T column (0.46 x 25cm; Tosoh, Tokyo, Japan). Fractions were eluted at 1 ml/mi. with 0.1% trifluoracetic acid for 5 min., followed by a linear gradient of acetonitrile (0.0-38.5% in 2 min., 38.5-45.5% in 60 min. and 45.5-70% in 2 min.) in 0.1% (v/v) trifluoracetic acid. Alpha- and beta-parvalbumin were separated and identified by N-terminal and peptide sequencing (beta-parvalbumin has a blocked N-terminus). The two parvalbumin sequences from Rana esculenta are identical except for the N-terminal methionine. The sequences from Rana spp. and Rana catesbeiana are 83% and 80% identical with those from Rana esculenta. The sequence of the beta-parvalbumin from cod, Q90YL0, is 53% identical and that of human alpha-parvalbumin, P20472, is 68% identical. 3-D structures are available of alpha-parvalbumins including human 1RJV, and 1RK9, and rat 1RWY. Bugajska-Schretter A, Elfman L, Fuchs T, Kapiotis S, Rumpold H, Valenta R, Spitzauer S.
Parvalbumin, a cross-reactive fish allergen, contains IgE-binding epitopes sensitive to periodate treatment and Ca2+ depletion. Hamada et al. (2004)  purified parvalbumins from bullfrog skeletal muscle, homogenized with 3 volumes of 0.15 M NaCl in 0.01 M phosphate buffer, pH 7.0, and centrifuged at 18000 g for 20 min. at 4° C. The supernatant was concentrated in vacuo and chromatographed on a Sepadex G-75 size exclusion column equilbrated with 0.15 M NaCl in 0.01 M phosphate buffer, pH 7.0. Fractions containing parvalbumin were identified by ELISA, pooled and applied to reverse phase HPLC on a TSKgel ODS-120T column (0.46 x 25cm; Tosoh, Tokyo, Japan). Fractions were eluted at 1 ml/mi. with 0.1% trifluoracetic acid for 5 min., followed by a linear gradient of acetonitrile (0.0-38.5% in 2 min., 38.5-45.5% in 60 min. and 45.5-70% in 2 min.) in 0.1% (v/v) trifluoracetic acid. Alpha- and beta-parvalbumin were separated and identified by N-terminal and peptide sequencing (beta-parvalbumin has a blocked N-terminus). The two parvalbumin sequences from Rana esculenta are identical except for the N-terminal methionine. The sequences from Rana spp. and Rana catesbeiana are 88% and 86% identical with those from Rana esculenta. Q90YK9 (Gad m 1) from cod and P02618 from carp are 69-70% identical. Q90WX7 from Rana catesbeiana is a homologue of the oncomodulin family. 3-D structures are available of beta-parvalbumins from carp, Cyprinus carpio, 4CPV, whiting, Merlangius merlangus, 1A75, silver hake, Merluccius Bilinearis, 1BU3, and pike, Esox lucius, 1PAL.